Heading to the Garden Isle and looking for the perfect accommodations? I called the Kauai Marriott Resort home for almost a week recently and it made all the difference during my travels. We’re talking an amazing pool, beach-front views, being thisclose to must-see sights, and the best hospitality! I had the pleasure of staying at the resort in collaboration with their media team (special thanks to the Marriott team for sponsoring this post!) and could not be happier with our choice of accommodations to Kauai. I’m no stranger to roughing it and have slept in my fair share of hostels with up to 14 other people (let’s just say that that particular experience was interesting), so my amazing travel buddy. Megan of TF Diaries, and I were open to a mix of different accommodations. 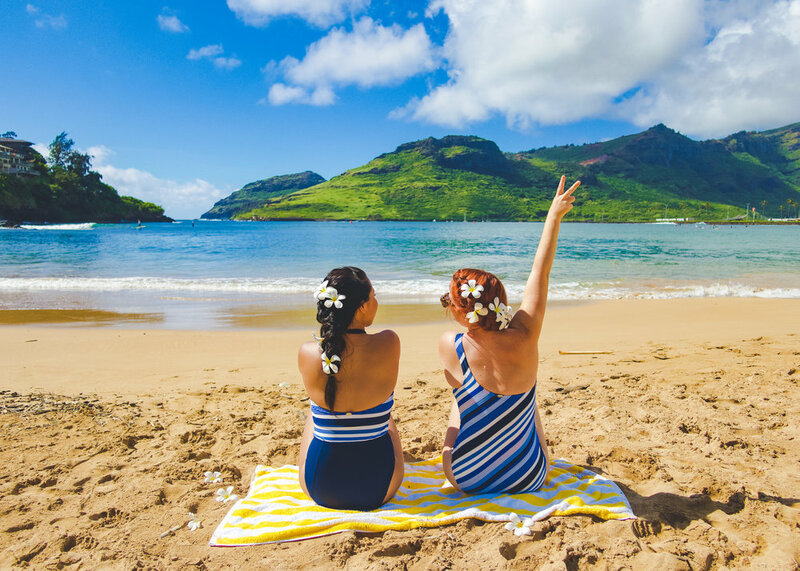 When we creeped on the Kauai Marriott Resort on Instagram and started looking into their reviews, it was very much a no-brainer to book a stay at the resort. It’s like Ryan Gosling showing up at your door - there’s just no way you’re turning it/him down. Amirite? The location of the Kauai Marriott Resort could not be more convenient in terms of accessibility from the airport. We were both surprised that the resort was less than a mile and a half from the Lihue Airport. Let’s be real - we’ve all had those experiences where the hotel or accommodations were wayyyyy farther than we originally expected. You haven’t seen cranky until you’ve seen a woman who is sleep-deprived, hangry and stepping off a 12-hour flight only to find that she still has another hour or so to go until she can take a nap. Your girl was so grateful to basically stumble out of the airport into the Hawaiian sunshine and to the hotel in less than five minutes. Winning. Another plus to being a guest at the Kauai Marriott Resort is that the resort offers a shuttle to help you get from the Lihue Airport. Just call once you’ve picked up your luggage and the shuttle should be there in 15 minutes. If you decide ahead of time to rent a car (it’s a must in my opinion! ), the car rental places at the Lihue Airport are a short shuttle away from where you pick up your bags. After spending nearly half a day crammed in a small airline seat (boy, do I miss living on the west coast - traveling from NY took forever! ), it was wonderful to be so close to the resort. Outside of the proximity to the airport, the location of the Kauai Marriott Resort was perfect for exploring all over the island. There were tons of must-see sights within a 15-minute drive, which made exploring every day incredibly easy and convenient. If you go to Hawaii and don’t go to the beach, did you even really go? My answer would definitely be a bigger-than-Texas no. As a born-and-raised California girl, I love the ocean and could pretty much spend all day out at the beach (which is definitely what I did for a good bit of my stay in Kauai). A few of our friends had just finished traveling through Kauai right before we flew in and had stayed at gorgeous hotel right next to a beach, and were disappointed to find that the beach near the hotel was not swimmable due to large pieces of wood that the waves piled up. During our stay in Kauai, we visited quite a few other beachfront resorts and hotel locations and found that they often had deep drop-offs or huge waves that were less than ideal for swimming, especially if you have small children or if you’re not the strongest swimmer. While Kauai has tons of swimmable beaches to choose from, having direct access to a safe-for-swim beach was a must for the accommodations we were originally considering. That being said, I could not have been more excited when I read that the Kauai Marriott Resort was right on Kalapaki Beach, a perfect beach for swimming and watching the sunset. The beach is protected by the Kalapaki Bay and the waves are gentle, so they were perfect for splashing in all day long or just lounging near in the chairs provided by the resort. If you’re also a fan of water activities, you can also rent surfboards, stand-up paddle boards, snorkeling gear and more at a kiosk by the resort’s pool. Speaking (or writing) of the pool, the Kauai Marriott Resort features Hawaii’s largest family-friendly swimming pool. The resort has a huge 4-section pool open from 7am to 10pm that we kept gravitating to throughout the trip. There were always tons of beach chairs available both in the sun and shade, and we loved that the pool was never crowded. There’s plenty of space for sunbathing, reading by the water, or just splashing around all day long (with tons of sunscreen and a good hat, of course). The hotel offers 5 restaurants including Kukui’s on Kalapaki Beach, Duke’s, Toro Tei and more. The breakfast buffet at Kukui’s was raved about by quite a few other guests, but is definitely on the pricier side at $30. I would recommend trying it once if you want to fill up for a big day out adventuring and then exploring the other restaurants - there are tons of great options directly on the resort or within walking distance. The Kalapaki Bay definitely gets its fair share of cruisers since the port is close by, so walking or driving for about five minutes will land you in a great area to check out more Hawaiian eats. Some of my favorite bites in Kauai include spam musubi, fresh mango, a Dole Whip, poke (go to the Food Land supermarket in Lihue for the wasabi or avocado poke! ), and shaved ice over a scoop of macadamia nut ice cream. The Kauai Marriott Resort is one of the big resorts in Kauai and it definitely shows as soon as you arrive. When we made the turn onto the resort’s grounds, we were immediately surrounded by some of the most beautiful tropical flowers and rows of stunning trees . The resort has so much “wow” factor and is so large that it actually took me about 15 minutes to check in because it took a while to get to the lobby and back. Upon pulling up to the hotel, you are greeted with big alohas from the staff before stepping onto a long escalator adorned with rows of beautiful native Hawaiian plants. From there, you pass a stunning garden, a huge koi fish pond, and even a large canoe with “aloha” written in the sand underneath it. That’s all before you make it to the front desk to check in, so let’s just say that this hotel’s facilities and amenities are definitely worth the visit. On our last day, we were still discovering new aspects to the hotel! Staying at the Kauai Marriott Resort pretty much defines “room with a view.” We had an ocean view room with a balcony on the 11th floor and woke up every morning (thanks to Kauai’s roosters) to watch the sunrise. While we didn’t spend much time in our room (except for binge-watching television with face masks on and catching up on our sleep), the room had tons of space and the bed was so comfortable that I almost didn’t want to get out of it every morning. Ok, let’s be real - I rarely want to get out of bed in general, but it really was magical to lay in bed each morning as we watched the sky change colors. The staff could not have been more helpful at the Kauai Marriott Resort. Everywhere we went, we were asked how we were doing and if there was anything we needed. We felt so welcomed and it made our stay even more relaxing! Whether you lose a room key (check) or need a late-night room service order of French fries (double check), the staff went out of their way to make sure we were able to kick back, relax and watch an episode or 10 of “Law and Order.” One of my absolute favorite members of housekeeping was Cress, a lovely woman who 100% exemplified the “Aloha Spirit” Hawaii is known for. If you’re flying out later in the evening and are planning on staying at the resort, I would definitely recommend taking advantage of the Kauai Marriott Resort’s hospitality room. The night before we left Hawaii, we asked the front desk about our options for storing our suitcases or extending our check out. They had an amazing alternative to doing both that we’re still amazed by. The team offered us access to an amazing hospitality room where we could shower and store our things after we had officially checked out. This meant that we got to spend our last day in Hawaii surfing, hanging out by the pool, and stuffing our faces with spam musubi without having to worry about having salt water in our hair during the long (very, very long) plane ride back to the mainland. All we had to do was pack a small day bag each and we were good to go! Are you planning to visit Kauai soon? Have you already been? Let me know what you think and if you have any questions about where to stay! 7 Halloween Movies to Watch This October.